I haven’t written in a while, and it hasn’t been for a lack of things to talk about. It has been because I have been so overwhelmed with everything going on that I haven’t been able to still my mind long enough to actually get any thoughts out. So today I just resolved to start typing and get it all out, here goes. Last time I wrote I talked about our new (old) dog, Moss. Moss has been a joy to adopt and we have really enjoyed him providing a companion to Coco, an extra friend to snuggle with, and he is teaching us about herding. We have taken him to a couple herding lessons and even a small trial and seen that he definitely is not lacking in talent, provided that the sheep are in on the game. Our sheep are most definitely not in on the game and he really enjoys watching them, but is downright confused and gives up when they don’t respond to him by running away like most sheep. We will work on that when the weather gets better. Speaking of weather, right now we are stuck at home. 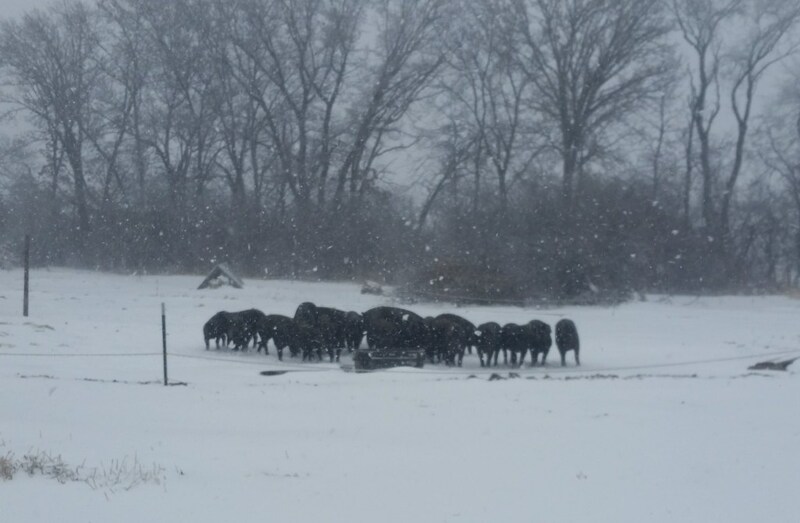 It is Sunday evening and I would like to be at the barn checking on lambs, but that won’t be happening until our neighbor comes to plow us out as we got the truck stuck trying to get out of the driveway. The local news dubbed this storm Evelyn and she has been a doozie. Friday started with a thunderstorm, which led to freezing rain all Friday night into Saturday, which then morphed into snow Saturday and continued all Saturday night and into the afternoon. It has slowed down considerably now, but the radar says we aren’t done yet, and this teacher is anxiously hoping for the call that she doesn’t have school tomorrow, or can at least sleep in a little. But now I am getting ahead of myself. Once we had settled in with Moss it was time for my Spring Break. In the fall we thought we were being all organized and had calculated the date at which we needed to put a ram in with the ewes so we could have most of the lambs born over Spring Break. 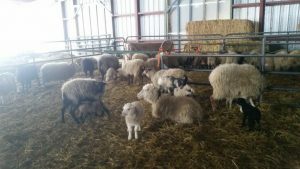 In the last six years we have grown our ewe flock from three to over 40 so lambing is no small matter around here, especially since you always hope for twins with sheep. Spring Break started and I was ready for lambs. Day one, nothing. Day two, nothing. Day three, one! This was the same as last year so I wasn’t worried at the time. Then days 4, 5, 6, 7, 8, 9, nothing. Over the entirety of my Spring Break, we had one lamb born. Icelandic Sheep are seasonal breeders so you can’t have lambs in February or Fall, but I thought that we did the right things to get lambs in March, and apparently the girls didn’t agree with me. While this was frustrating, it didn’t turn out to be all that bad, because my Spring Break kept me occupied with other things. The second day of break we attempted to move one of our boars, and it didn’t go well. I will let Jordan tell the story some other time, but it ended with Jordan having surgery on his leg and not being mobile for a few days. The upside was that I was home for the week so I could do all the chores. But that meant that I had to do all the chores, something I hadn’t done in a long time and found challenging. I had some help from friends and neighbors and over the week my confidence grew so by the end of the week I felt really good about it, and then my knee (which hadn’t acted up in years) told me to go back to my teaching job and that diving head first into complete farm management was a little too much. Jordan was able to do a lot of the work on his own at that time, but we are two weeks out from his surgery and can tell it will be a long road to full recovery so I am still spending more time on chores with him to lighten the load. Back to lambing. The first two that were born was a set of twins, and the mom only accepted one of them. The other one we fed by tying mom up multiple times a day in hopes that she would eventually accept him, to no avail. He got pretty good at stealing milk from her when she wasn’t watching, but after a week it got much colder and he wasn’t getting enough nutrients so he became chilled. This led to us having a house lamb for a week while we got him back up to standard. Thankfully(I guess) there weren’t a lot of other lambs being born to keep us busy! The lambs did eventually start coming, but it has been slow. We are now three weeks from our official start date and we are about 1/4 of the way through the ewes, with 17 lambs on the ground. It is starting to seem like there are lambs everywhere, so soon it will (hopefully) be a near overwhelming number of lambs. The other baby news is that of piglets. Our favorite sow, Wren, had a wonderful litter of 10 piglets two weeks ago that all have all made it so far. The next two sows were not as lucky. Maxi made a poor choice of farrowing spot (outdoors in bad weather) and she is one that cannot be argued with so none of her pigs made it. Peekaboo also had hers in bad weather but has had a little more success with some survivors. However, last week we went into the pen with Wren to ear notch (for identification) and castrate her pigs, and suddenly there were more pigs there than before! Her daughter, Wilma, was also in that pen and had started to farrow with very little fanfare. We dealt with Wren’s pigs and then left them alone. 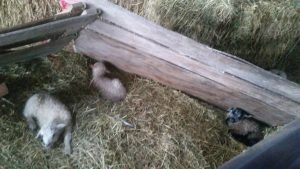 The next day Jordan was doing chores and went to count and there were 21 little pigs in a pile! They all seem to be doing well and Wren and Wilma are co-mothering them. 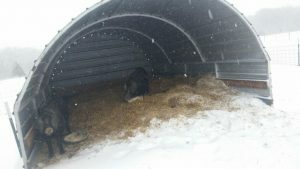 They have made a large depression in their bedding that their pigs can nestle in even when they are up getting food or water, which was a great strategy in this nasty weather. Finally, yesterday we had another form of success. We have been looking for more outlets for our meat and this year made the decision to add another farmers market. We debated which geographic direction to go, and ended up returning to the first place we called home together: the West side of Madison. The Westside Community Market is a long-standing market that we knew well as Jordan’s dad sold yogurt there for 15 years until closing up shop in 2016. While the words “Madison” and “farmers market” often evoke images of the Dane County Farmers Market on the Capitol Square, the Westside Community Market is much more our style. The downtown one is somewhat festival-like with lots of different things going on, whereas the Westside one is much more similar to the European street markets where people actually go to get their shopping done. And this has never rung more true than yesterday. 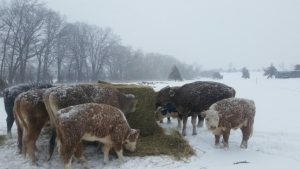 It was the first market of the season, and the weather looked better in Madison than at home, so I made the decision to tough it out and drove down early Saturday morning. I didn’t make it there by the 7am opening, but was set up by 8. There were 14 vendors, as opposed to the 40+ that should normally be there, but a surprising number of customers braved the 34 degree temp with rain and snow. They drove up (and with so few people they could literally drive right up to the booth they wanted to shop from) and got what they came for and went home. The customers were very kind and encouraging to those of us who came out, and I think there may have been a few pity sales as well, for which I can only express gratitude. I was dressed in good clothes for the weather and made it four hours before the remaining four vendors decided to shut it down a half hour early. The moral of the story is, the Westside Community Market is awesome, you should check it out! This has certainly been a roller-coaster of a month, and I have learned to be grateful for many little things along the way. Right now I am grateful that our neighbor came over to plow us out while I was typing this so I can go check on our lambs! Take care! P.S. We went to the farm and there were five new lambs that had been born in the afternoon, and on the way home I got the phone call that tomorrow is a snow day!